Whether you call them grinders, heroes, hoagies, subs, gyros, poor boys, torpedos or wedges, almost every cuisine across the country has their favorite sandwich built on a crusty, submarine-shaped roll. While some historians believe that grinders are so-called because you have to grind your teeth vigorously to chew the crusty bread, others will tell you that they were named for the welders and grinders at the shipyards in Groton, Connecticut, who popularized the sandwich in that area. In any case, the origin of the grinder sandwich is normally associated with southeastern Connecticut and Rhode Island. 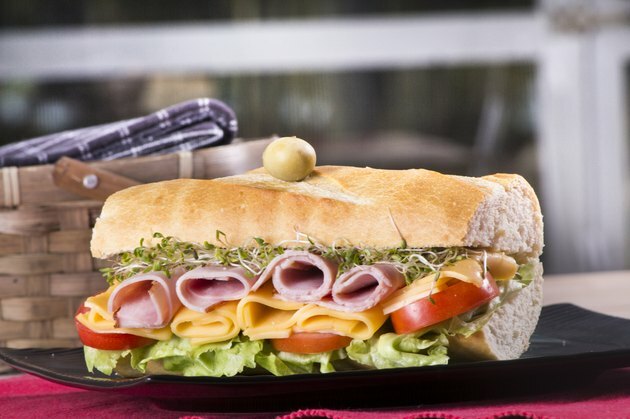 A classic grinder contains little more than Italian lunch meats, provolone cheese and copious amounts of olive oil, but modern usage includes any type of sandwich, hot or cold, served on a grinder roll. Set an 8-inch grinder roll on a cutting board. If using a full-size loaf of Italian bread, cut it into halves or thirds. Turn the bread on its side, with one seam facing upward. Cut the bread from end to end using a large, serrated knife. Only cut down as far as the other side without cutting the seam so that the bread opens up like a butterfly. Spread your desired condiments, such as mustard or horseradish cream, on the bottom half of the roll. Layer several slices of meat across the sandwich. Appropriate meats for a hot grinder include salami, mortadella, pepperoni, brisket, ham, prosciutto, roast beef or turkey. Top the meat with a layer of sliced cheese that is appropriate to the meat. You might use provolone cheese on an Italian-inspired grinder, or Swiss, cheddar or American cheese on a turkey, roast beef or ham grinder. Drizzle olive oil over the sandwich. Lay the grinder on a baking sheet so that it is open, with both the meat-and-cheese side facing up as well as the inside of the other half of the roll. Place the grinder under the broiler just until the cheese begins to melt and the bread becomes lightly toasted. Remove the grinder from the broiler. Top the meat and cheese with shredded iceberg lettuce, sliced tomatoes and any other desired toppings, such as sliced onion, roasted peppers or sliced black olives. Drizzle the toppings with olive oil and red wine vinegar, and season to taste with salt and pepper. Spread meatballs, sausage and peppers, breaded, fried boneless chicken breasts or eggplant slices on one side of the bread, and top with tomato sauce. Top the meat with Parmesan cheese and slices of provolone or mozzarella, or a combination of all three cheeses. Place the sandwich under the broiler until the cheese melts and the bread becomes lightly toasted. Spread any condiments on one side of the bread, such as mustard, horseradish cream or mayonnaise. Place a layer of meat on top of the bread that contains the condiments. You can use any of the meats used in a hot deli meat grinder, as well as other meats, such as bologna, liverwurst or any other deli meat. You may also use tuna fish, chicken salad or seafood salad on a cold grinder. Top the meat or salad with a layer of shredded iceberg lettuce, followed by sliced tomato and any other toppings, including sliced onion, roasted, pickled or raw peppers, cucumber slices, sliced olives or pickle slices. Drizzle oil and vinegar, or any salad dressing of your choice, over the toppings. Season to taste with salt and pepper. Experiment with your fillings and toppings to create your own unique grinder sandwich. Celebrity chef Emeril Lagasse stays fairly true to a classic grinder, using salami, mortadella, provolone and Swiss cheese with a topping of banana peppers, while Bobby Flay puts a new spin on the sandwich, using brisket, steak sauce, mayonnaise, scrambled eggs and crushed potato chips.